Do Not Clean Your Coins without the advice and guidance of someone familiar with the process. Cleaning can ruin the value of your coin by causing the coin surface to begin to wear. This is a natural discoloration of a coin's surface caused by the atmosphere over a long period of time. Toning can be very attractive. Some collectors prefer to collect coins with this feature. often actually adds value to the coin. Collectors and dealers actually expect to see this natural aging in coins, and it is actually proof that it is an authentic coin. Cleaning coins often leaves small scratches, spots or pock marks unless done by someone familiar with the process. Always check with a coin dealer or other trustworthy coin expert before deciding to clean the coin. it is best not to clean them!!! Here are a few things about Cleaning Coins that will keep damage to the coins to a minimum. The first thing to remember is that cleaning coins always requires a very light touch. Never rub your coins or scrub them with anything abrasive. Sometimes a coin is just dirty. An example would be a coin found with a metal detector. You can try soaking the coin in mild soapy water. Once again, please do not rub the coin between your fingers. If there is still some dirt crusted on the coin, you can try soaking the coin in olive oil for a couple of days and then very gently pick the dirt off with a toothpick. Use the toothpick gently and carefully so as to minimize scratches. Rinse thoroughly and use a soft cotton cloth to gently pat dry. Never use paper towels as they can scratch. Never use abrasive cleaners such as jewelry and metal polishes when cleaning coins. Cleaning silver coins with silver tarnish remover, for example, will ruin the coin's natural toning. This refers to chemically cleaning a coin with a diluted acid. It used to be common practice until it was discovered that it destroyed the surface of the coin and reduced the coin's value., but this method was found to be too damaging. Please, do not attempt this process yourself if you value your coin. 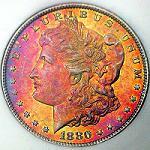 Avoid using baking soda to shine your coin. As I stated earlier, natural aging and "toning" may actually add value to your coin. It can sometimes actually be quite beautiful, even iridescent. 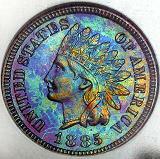 Some collectors and dealers are drawn to these iridescent coins and actually pay a premium for them. A Coin that has been specially struck for collectors using polished dies and planchets. These coins have a very shiny mirrorlike finish with extra sharp details and are not intended for circulation although they are legal tender. coin which is supposed to be shiny. PVC or polyvinyl chloride used to be widely used in making coin holders. It can still be found in a lot of soft plastic 'flips', so use care when choosing long-term storage solutions for your coins. Be sure your choice does not contain PVC. Over a period of time these materials containing PVC react chemically causing greenish slime or oily film to be deposited on coins stored for long periods of time in these holders. Besides the visible gunk, the acids from the PVC slime can actually etch the surface of coins. PVC slime can be removed from coins with Acetone, but you must be very careful as acetone is a dangerous chemical. Be sure to wear latex gloves and eye protection and use in a well ventilated area. Caution: Use extreme care when using acetone. It is a dangerous chemical. Be sure to read all warning labels on the bottle and follow them closely. Pour a very small amount of acetone into a small glass or jar (just enough to cover the coin) and gently swirl the jar to help in removing the slime. Only add one coin at a time to the jar to avoid friction between the coins, and never use plastic containers as the acetone will melt them. If traces of the slime remains, you can moisten a cotton swab with the acetone and very gently swab the coin using a rolling motion until all traces of the PVC slime are gone. Remember to never rub or scrub with the swab or you could cause hairline scratches in your coin. Way back when, before they learned better, coin collectors used to coat their coins with lacquer in an attempt to protect them. As the lacquer aged it became dry and brittle and chipped, cracked or peeled allowing the coins to tarnish in splotches that was very unattractive. Today, grading services will not even grade a coin that has any lacquer remaining on it. To remove lacquer from a coin in your collection, you can soak the coin in acetone for a short time. If lacquer remains on the coin, you may need to repeat the soaking until all traces are gone. Once again, please use extreme caution when using this dangerous chemical. On a final note, most coin supply stores carry some commercial coin cleaners that are formulated specifically for coins but they are on the expensive side. Again, you should get the advice of a dealer or coin expert you trust before any attempt at cleaning coins in your collection. For more information about caring for the coins in your collection head on over to The US Mint Site.